The European Court of Human Rights in Strasbourg ruled in the favour of five media companies yesterday, recognising a journalistic right to protect anonymous sources, reports AFP. Mustafa Kemal Atatürk (1881–10 November 1938) was a Turkish army officer, revolutionary statesman, and founder of the Republic of Turkey as well as its first President. The buzz surrounding Plastic Logic‘s highly anticipated e-reader was renewed yesterday with the release of an official name for the device, and more importantly, an official launch date. 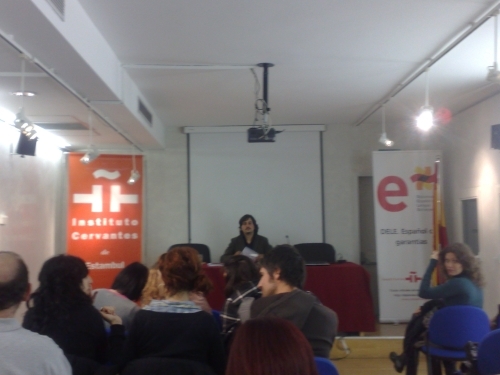 Live from 17th Annual EU – Turkey Conference of Journalists at Bilgi U. All coverage is through Erkan’s filtering/paraphrasing. Please be careful in quoting. I strongly recommend to get actual transcripts instead of relying my interpretative quotation style. And I am not particularly good at concentrated listening! (Participants in alphabetical order: Mehmet Altan (Star), Murat Belge (Taraf), Florence Biedermann (AFP, Fransa), Abdülhamit Bilici (Zaman / Cihan Haber Ajansı), Mehmet Ali Birand (Posta / Milliyet/ HDN / Kanal D), Eyüp Can (Referans), Cansu Çamlıbel (Hürriyet), Evangelos Demiris (Athens News Agency, Yunanistan), Konstanty Gebert (Gazeta Wyborcza, Polonya), Rolf Gustavsson (Svenska Dagbladet, İsveç), Emil Hurezeanu (Realitatea-Catavencu, Romanya), John Peet (The Economist, Birleşik Krallık), Bernardo de Miguel Renedo (Cinco Dias, İspanya) ve Michael Thumann (Die Zeit, Almanya). This is post in progress. Pierini: 60 European journalists are brought to Turkey and 60 Turkish ones sent this year. Turkey is member of every European organizations except the EU. The Meetings has an officially blog-style site for photos, videos and other informative stuff. In the opening talk, Mr. Erdoğan also hinted at protests outside underlining the fact that global economic life is hard and protests are not totally unjustified. Protests in Taksim, very close to meeting center. I have now a post on protest roundup. And all other media roundup on meetings updated in yet another post. Glad to make it to the press room with his Lamb of God sweatshirt, unshaved face and hangover mood; not stopped by police for being a potential protester.